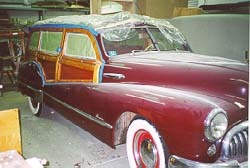 Henry Hopkins '47 Buick is in the shop for minor wood repair and fresh varnish. 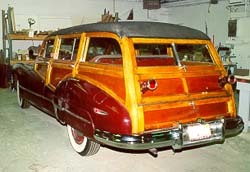 Door handles, taillights, brackets and thru-bolts have all been removed. 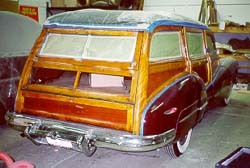 Tailgate panel was removed for repair. 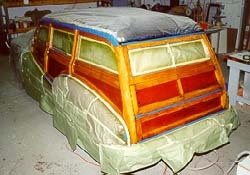 Entire car is masked off in preparation for sanding, bleaching and restoration. New wood patch is spliced in where thru-bolt area was rotted on rear post. 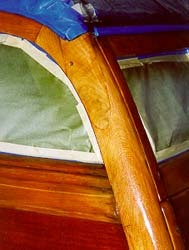 Six coats of varnish is sprayed on, with hand sanding in between coats. 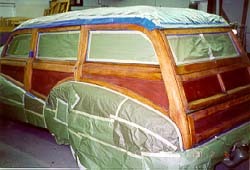 Final varnish is applied. All hardware is reinstalled, and a very happy owner is ready to drive it home!